I love agriculture because it teaches life lessons early. Those lessons regarding the unjustness of nature, the pay off of perseverance, the redemption found in faith and hard work, the value of honesty, and the lasting impact of friendships formed through the lifestyle. I love agriculture because it creates the strongest of family bonds in a way only shared daily joys and discomforts of agricultural life can. I love agriculture because it gives the troubled heart and mind fulfilling tasks at hand outside in God’s creation. A good night’s sleep is sure to follow a day spent using both the mind and body. I love agriculture because it maintains that which parts of this world are physically starving for, and that which most of this world is spiritually starving for. I love agriculture because of its unique ability to combine progress and tradition – two ideals that naturally and typically clash. I love agriculture because it gives credit to those most deserving in life but least valued by the world. I love agriculture because it creates opportunity for the pursuit of life, liberty, and happiness – requiring only work ethic and try. I love agriculture for the inspiration it gave an Iowa-raised farm boy to homestead in Rupert, Idaho and raise a farm family while growing potatoes, sugar beets, and malt barley. 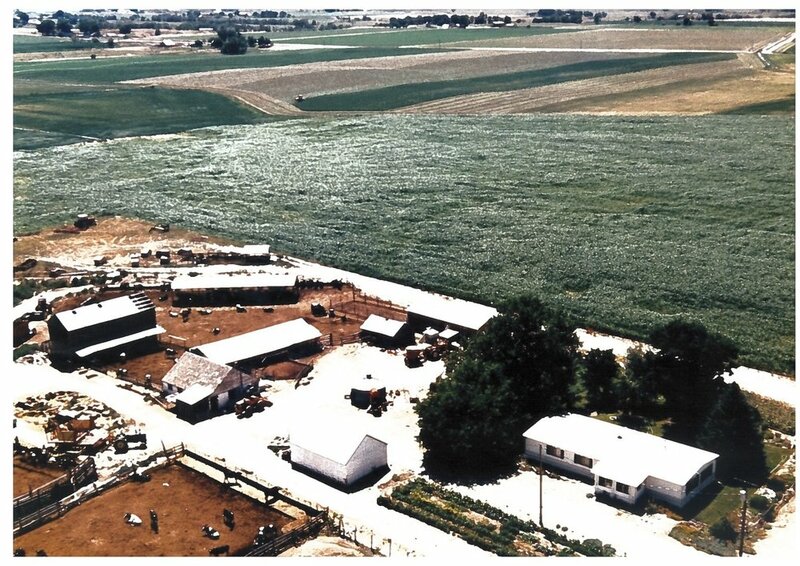 I love agriculture for the deep love of growing crops and milking cows it instilled in four generations of dairy farmers in the Emmett, Idaho area. I love agriculture for the common ground it provided for my parents to marry and give my four siblings and me an agricultural upbringing. I’ve seen agriculture unite thousands of students from different backgrounds with a common curiosity and interest under a common cause and passion. I’ve seen agriculture keep people alive for years who should have died in months. When the world is relying on you for their daily needs, you get out of bed. I’ve seen agriculture give young people a solid moral base from which to grow and to one day return. I love agriculture because it offers the very best in life: hard work in exchange for an honest living, the chance to gain all kinds of education, and the opportunity to develop true character and integrity. When I decided to go to Cambridge High School my freshman year and jump on the FFA bandwagon, I had no idea what I was signing up for. I thought FFA was just a way to bring an animal to the fair without having to do a 4-H record book(those things were the worst, am I right?). Little did I know that FFA would give me countless amazing opportunities including showing animals at fair, being a chapter and district officer, state leadership conferences, competing in amazing CDEs, and going to national convention two years in a row. As well as winning a trip to the American Institute of Floral Design symposium in Washington DC, and this coming February, the opportunity to attend the International Production and Processing Expo in Atlanta, Georgia to learn more about food science. And this is only a fraction of the incredible opportunities FFA has given me. But more importantly, FFA has taught me life lessons that you can’t get anywhere else. FFA has taught me that being a leader is about serving the people around you; encouraging them and lifting them up. Leadership isn’t a rank or a huge position you are put in, I think it is a choice to see the position you are in as a chance to serve and inspire the people around you. Being a leader doesn’t mean that you never make mistakes. It means that when you make mistakes you acknowledge them, you learn from them, and you grow from them. FFA has taught me how to be proactive. That when we have an awesome vision, it doesn’t just have to be something we sit back and dream about. We have the power to make changes and do things that seem impossible, we just have to get up and take action. It taught me that when we do take action, time management, communication, and commitment are all crucial. FFA has taught me the value of truly working towards a goal and the rewards that you gain from accomplishing them. I remember waiting backstage at SLC my freshman year before my Floriculture team went on stage to hear our results. That is the most nervous I have ever been in my life and I think it’s because my team and I had put so much time and effort into preparing for that competition and we wanted to see it pay off. It definitely did when all four of us placed as the top four individuals. This was the first time that I was truly able to see how special it is when you can see that the work you put into something really does matter and it shows. FFA has taught me that it’s okay to fail. It’s okay to take risks and go outside of your comfort zone. You have nothing to lose. Something that is a constant struggle for me is the fear of not being good enough. Last spring when I decided to run for district office I was excited and I worked really hard to make sure that my application was the best quality I could make it. I also studied hard for the knowledge exam and prepared well for my interview. I was definitely prepared, yet I still allowed the fear to creep in, and I started listening to the voices in my head telling me I wasn’t good enough. The morning of district officer sifting I had a melt down in my FFA advisor’s room, because I was scared that I wouldn’t be good enough (not my proudest moment). I managed to stop overthinking it and decided that I really had nothing to lose. I’m so glad that I was able to overcome my fear in that moment, because being able to serve as a district officer and build new relationships through that has been an exciting and humbling experience. FFA has taught me that it is imperative to surround yourself with people who bring you up, people who inspire you, and people who make you feel like you don’t have to hide behind a mask, like you can be your true self. At DOT this year, I was able to see that the FFA organization is full of these types of people, and I was reminded why I love FFA and how lucky I am to be a part of it. FFA taught me the value of making strong relationships with people who will always be there for you. Most importantly, FFA has taught me that together we can make a big difference. It’s okay to ask for help and we don’t have to do everything on our own. FFA has taught me that we have a purpose, and together, we can accomplish anything we put our minds to. Annalise, you represent the true spirit of FFA! We are so proud to have you as a member of the Idaho FFA Association. From my Freshmen year until now, I have been a member of the National FFA Organization. I cannot begin to express the amount of gratitude I have towards this program and the various opportunities I have received from my participation. These are just a few things I’ve come to love out of the endless list of opportunities the FFA has to offer. One of the keystones of the FFA, and what I believe is one of the most exciting and enjoyable parts, are the competitions. Otherwise known as CDE’s and LDE’s, these contests offer members a fun way to prove what they know about specific items in agriculture. My Freshmen year, I remember memorizing the FFA creed and presenting it at the state level. Into my Sophomore year, I remember the extreme happiness when my Soil and Land Judging team finally won the state championship. From Food Science to Dairy Judging to Parliamentary Procedure, I’ve gained so many life skills from these experiences that I can utilize after high school, including: public speaking, communication, decision-making, teamwork, etc. These events are truly one of the reasons why I have such a passion for the FFA organization. My favorite part of the FFA program is the chance to meet new people! I have made so many close friendships with other students my age from across the entire state. From Troy to Jerome to Madison, I can’t believe the amount of people I’ve been able to meet and form a personal connection with. Honestly, I love meeting other members and finding common interests, whether that be FFA related or not. District Officer Training was probably the best trip I’ve been on this year so far! I had the opportunity to meet other district officers from the various districts across Idaho. It was great to see the transition of the members from absolute strangers to close friends. It’s the best feeling watching other people get to know each other. If any of you see me at State Leadership Conference, Moscow State CDE’s, or anywhere else, feel free to come up and talk to me! The travel opportunities that come out of FFA are limitless. I’ve spent time in California, Indiana, and Oklahoma and visited major cities like Chicago, Indianapolis, and Dallas. I am so thankful for the places I’ve been able to visit and all the new experiences I’ve gained and new things I’ve learned along the way. The agricultural industry is so broad and diverse, and it’s awesome to see how it varies from place to place. One of my favorite trips is going to the annual National FFA Convention and Expo. Once you’re able to walk past thousands of other blue jackets, it really puts things into a different perspective. I’ve realized that the organization is bigger than myself, but that it doesn’t mean I can’t make an impact. Agriculture is one of the largest and most important industries in the nation. 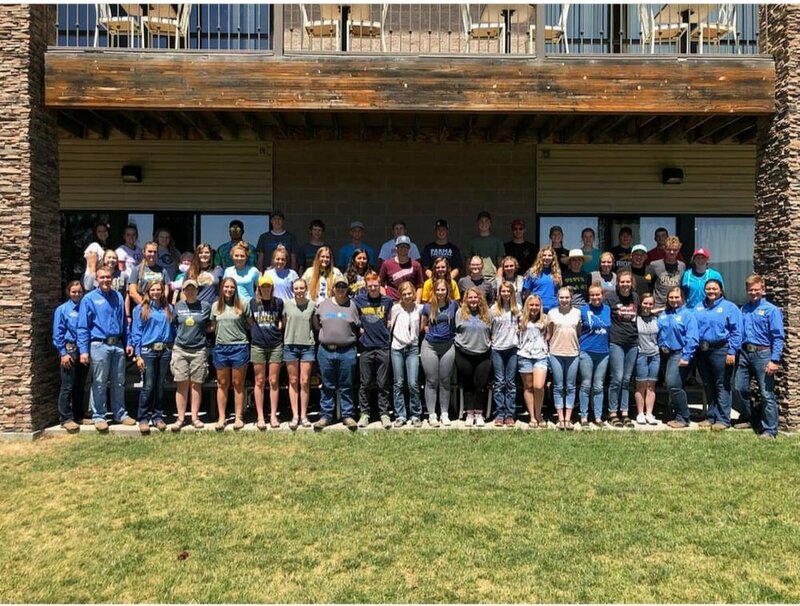 The fact that the FFA offers high school kids the chance to be connected to it is incredible. Kids are taught that ag isn’t just farming. Ag is business, it’s biotechnology, it’s engineering. There is a place for everyone in the industry, and FFA members are able to successfully pursue a career with the information they’ve learned and the skills they’ve gained from their membership. I’ve grown up on a dairy farm and through my firsthand experience of being a farmer, I can say I have grown to appreciate agriculture, and through FFA, I’m proud to represent it. Finally, I cannot begin to say how much the National FFA Organization has impacted me on a personal level. I have changed so much from the person I was when I started high school to the person I am today, and that’s all thanks to the FFA. Through officer positions and being involved at a chapter, district, and state level, I’ve become a better version of myself. I’ve gained confidence, social skills, a willingness to try new things, and a sense of belonging. Ultimately, the FFA gave me my purpose. FFA is the best thing that’s come into my life. I’m extremely grateful for this extraordinary organization and I don’t know where I would be without it. I’m pumped to continue being involved in the Idaho FFA Association in my last year of high school. Herman, thank you for sharing five of our favorite parts of FFA! 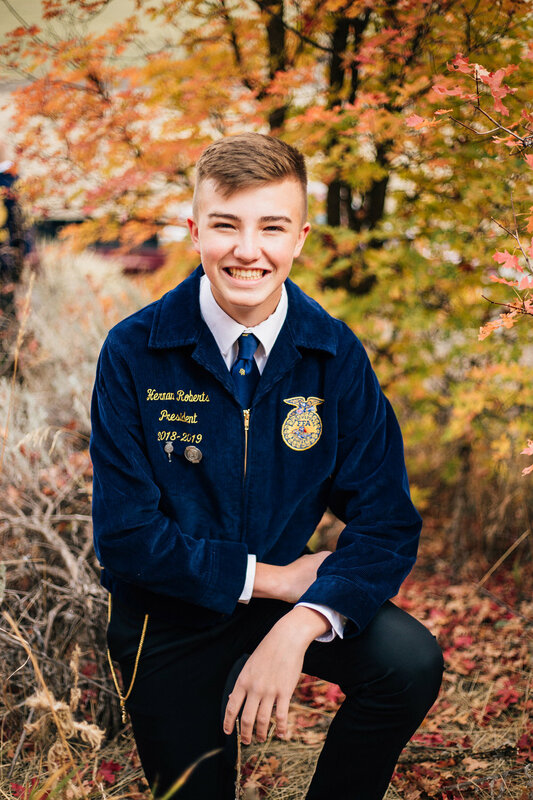 You are a true example of leadership and we are proud to say you are a part of the Idaho FFA Association! Check Here for an Archive of Idaho FFA Blog Posts!